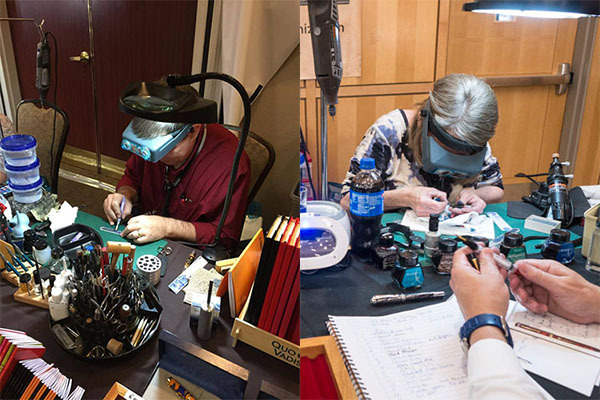 US Fountain Pen Show Schedule. • What services do you offer at a show? • What forms of payment do you accept? • I made it to the show but where are you? • How do I get my pens seen by you? • How many pens can I have worked on? • Can I drop my pens off to be worked on? • I got on your list, how will I know when it is my turn? • If I buy a pen from you, do I have to get on the list to have a custom grind? • I want to buy some ink and paper but you are busy working on a pen, what do I do? • Can you adjust for different types of paper? • What happens if you do not get through your list by the end of the day? • Do you break down early on Sunday? • Do you have "Call Ahead Seating"? • Do you prefer our pens inked or un-inked? What services do you offer at a show? Obviously we cannot do everything at a show as we only have room for so much equipment. Bent nibs are one thing that we avoid at shows as they are so time consuming. A particularly difficult nib could end up taking up too much time and we like to work with as many people as possible. For the most part Linda does nib smoothing and custom grinds. Mike will do some smoothings when Linda is backed up and has time but mainly does filling system restorations. We accept Visa, M/C, Discover, AMEX, checks, and cash. I made it to the show but where are you? Ask the people when you come in. We are not always in a location that a sign can be put up or seen from across the room. Once we are set up and working, we are the couple sitting side by side and you can only see the tops of our heads while we are working. How do I get my pens seen by you? How many pens can I have worked on? We will work on as many pens as time will permit, but only one at a time. If you have more than one pen that you want serviced, once we have finished your first pen please feel free to add your name to the list again. If we are not busy or do not have anyone on the list we will work with you until that changes. Can I drop my pens off to be worked on? We have tried this in the past and most times this does not work. These pens usually get pushed to the side while we are working with people that take the time to sit with us. We also like to have your input via testing to make sure we are achieving what you want in your pen. I got on your list, how will I know when it is my turn? When we are ready for the next name on the list we will call out that name. If nobody comes when called we move on to the next name on the list. We do have people that put their cell number next to their name so they do not get passed over. If I buy a pen from you, do I have to get on the list to have a custom grind? No. If you purchase a pen from us and want a stub grind, you will be the next person to sit with Linda once she finishes with the current person she is working with. I want to buy some ink and paper but you are busy working on a pen, what do I do? Most of the time when you see us at our table we are happily engrossed in our work. This does not mean we are not approachable. You are more than welcome to interrupt Mike. Linda can be interrupted as well but not when she has a nib to the grinder. We actually enjoy talking with people as we work. Can you adjust for different types of paper? Yes, please bring with you the paper you wish to have the pen tuned for. What happens if you do not get through your list by the end of the day? There are many times we have worked until they kick us out of the room. But, there is always tomorrow, unless it is the last day of the show. Before the show starts the next day we will put out a new list and start all over. The list fills up quickly, so it is best to get on it early. Do you break down early on Sunday? No. We usually stay that night and start our travels back to our studio the next day, so breaking down early does not make sense. Do you have "Call Ahead Seating"? You need to be present at the show to have your name on our work list. Do you prefer pens inked or un-inked?? It is best to bring your pens in un-unked. 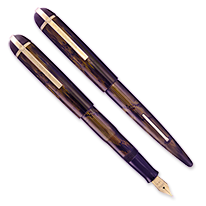 If you have ink in your pens that is fine, but note that we will empty your pen prior to working on it. We test exclusively with Waterman's blue-black ink.